Beautifully detailed inside and out, the Audi TT might never have offered the sort of amazing drive those jaw-dropping looks promised, but that mattered little. Wow. Even today the original TT gets that response. Audi absolutely shocked everyone when it originally showed its TT concept at the 1995 Frankfurt Motor Show. It would shock again when it went ahead and built it with its styling virtually unchanged from the show car. Beautifully detailed inside and out, it might never have offered the sort of amazing drive those jaw-dropping looks promised, but that mattered little. It was simply an icon, and subsequent generations have failed to live up to that billing somewhat. Audi introduced the TT with a choice of two outputs via a turbocharged 1.8-litre petrol engine. The maximum power was either 180- or 225hp, the latter mated with quattro four-wheel drive, while the 180hp car was also available as a front-wheel drive model. Check for quattro badging and the paperwork if you're not sure, or have a good look underneath for extra driveshafts at the back. Visually the 180hp and 225hp cars were easily differentiated by looking at the rear, as the 180hp car has a single tailpipe on the left-hand side, the 225hp featuring a second exhaust pipe on the right of the car. The lesser output car makes do with a five-speed manual gearbox too, as opposed to the 225hp's six-speeder. Either version comes well specified as standard, with alloy wheels, air conditioning and sports seats; options included upgraded Bose audio and leather upholstery. Audi also offered a 3.2-litre V6 petrol quattro model as a flagship, but the additional weight of the heavy engine in its nose did little to add to the driving experience; plus, the 225hp car was only fractionally slower. A roadster joined the line-up in 1999, it losing the rear seats (if you can really call the tiny pews in the coupé 'seats') to make way for the folding roof. It lost boot space too. The TT coupé is actually quite a practical machine (for something so obviously sporting) thanks to its large hatchback opening and the ability to fold the rear seats down. Later Audi would offer a 150hp front-driven TT, but by far the biggest sellers were the 180 and 225 models. 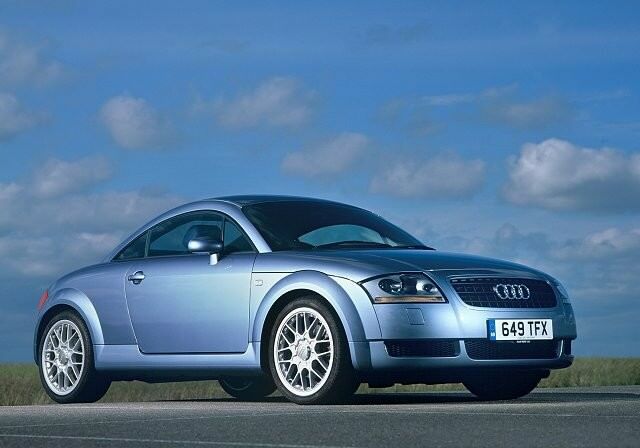 A special, near end of production special, dubbed the TT quattro Sport, was offered in coupé format only. It did without the rear seats and gained other weight saving measures including fixed back sports seats. It was visually distinguished by its larger rear boot lid spoiler and the body kit from the 3.2-litre V6 model, with the roof and mirror housings painted in black. Fast or faster is pretty much your decision maker. The 180hp car is brisk enough - reaching 100km/h from rest in under 7.5 seconds, while the 225hp car managed 6.4 seconds. Running costs will be comparable. Avoid the V6, and we'd have the coupé over the roadster, purely down to its greater day-to-day usability. A stunning looking car, the Audi TT might not be the most exciting thing to drive, but as something to enjoy it's difficult to fault. Impeccable build quality, brisk and - in coupé form at least - reasonably sensible, the TT is rightfully an icon. Grab a good one and covet it, as it's a bona fide future classic.